A mountaintop mining operation in West Virginia. Photograph courtesy of the US EPA. 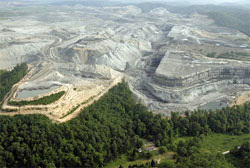 After extensive scientific study, a major public hearing in West Virginia and review of more than 50,000 public comments, the U.S. Environmental Protection Agency (EPA) on January 13, 2011 announced that it will use its authority under the Clean Water Act to halt the proposed disposal of mining waste in streams at the Mingo-Logan Coal Company’s Spruce No. 1 coal mine. EPA is acting under the law and using the best science to protect water quality, wildlife and Appalachian communities, who rely on clean waters for drinking, fishing and swimming. EPA has used this Clean Water Act authority in just 12 circumstances since 1972 and reserves this authority for only unacceptable cases. This permit was first proposed in the 1990s and has been held up in the courts ever since. EPA’s final determination on the Spruce Mine comes after discussions with the company spanning more than a year failed to produce an agreement that would lead to a significant decrease in impacts to the environment and Appalachian communities. The action prevents the mine from disposing of the waste into streams unless the company identifies an alternative mining design that would avoid irreversible damage to water quality and meets the requirements of the law. Despite EPA’s willingness to consider alternatives, Mingo Logan did not offer any new proposed mining configurations in response to EPA’s Recommended Determination. Disposed of 110 million cubic yards of coal mine waste into streams. Buried more than six miles of high-quality streams in Logan County, West Virginia with millions of tons of mining waste from the dynamiting of more than 2,200 acres of mountains and forestlands. Buried more than 35,000 feet of high-quality streams under mining waste, which will eliminate all fish, small invertebrates, salamanders, and other wildlife that live in them. Polluted downstream waters as a result of burying these streams, which will lead to unhealthy levels of salinity and toxic levels of selenium that turn fresh water into salty water. The resulting waste that then fills valleys and streams can significantly compromise water quality, often causing permanent damage to ecosystems and streams. Caused downstream watershed degradation that will kill wildlife, impact birdlife, reduce habitat value, and increase susceptibility to toxic algal blooms. Inadequately mitigated for the mine’s environmental impacts by not replacing streams being buried, and attempting to use stormwater ditches as compensation for natural stream losses. Additionally, during the permitting process there was a failure to consider cumulative watershed degradation resulting from past, present, and future mining in the area. Finally, EPA’s decision prohibits five proposed valley fills in two streams, Pigeonroost Branch, and Oldhouse Branch, and their tributaries. Mining activities at the Spruce site are underway in Seng Camp Creek as a result of a prior agreement reached in the active litigation with the Mingo Logan Coal Company. EPA’s Final Determination does not affect current mining in Seng Camp Creek. Clean Water Act Section 404(c) authorizes EPA to restrict or prohibit placing dredged or fill material in streams, lakes, rivers, wetlands and other waters if the agency determines that the activities would result in “unacceptable adverse effects” to the environment, water quality, or water supplies. This authority applies to proposed projects as well as projects previously permitted under the Clean Water Act although EPA is not considering such action for other previously permitted projects. This news is from the US EPA available at www.epa.gov.